Toy Lamp by Fabian Schmidt. 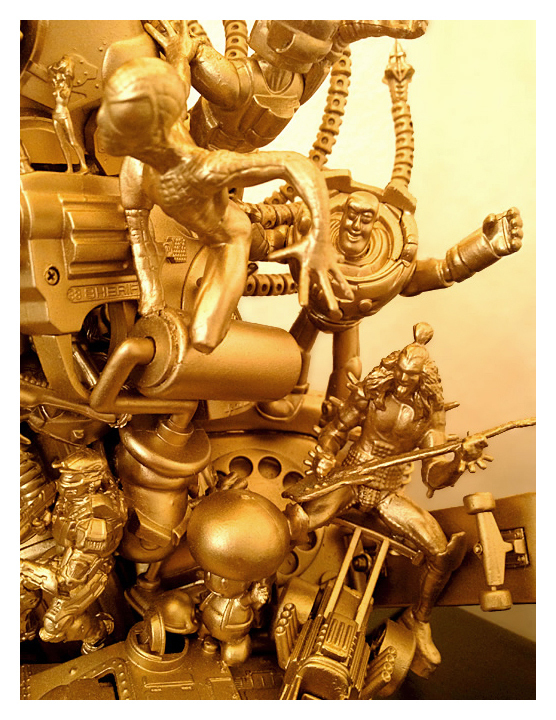 A carefully chosen selection of classic figures of the genres "fables", "comic" and "children's stories" (for example Lucky Luke, Shrek, Bambi, SpongeBob, Cinderella, Winnie Puuh, Snoopy and many more...) provide the basis for this unique handcrafted lamp varnished in plain white. All characters were draped 360° all around the isochromatic, wooden table lamp (varnished) and joined up by various methods. Finally the lamp was coated with a glossy finish. 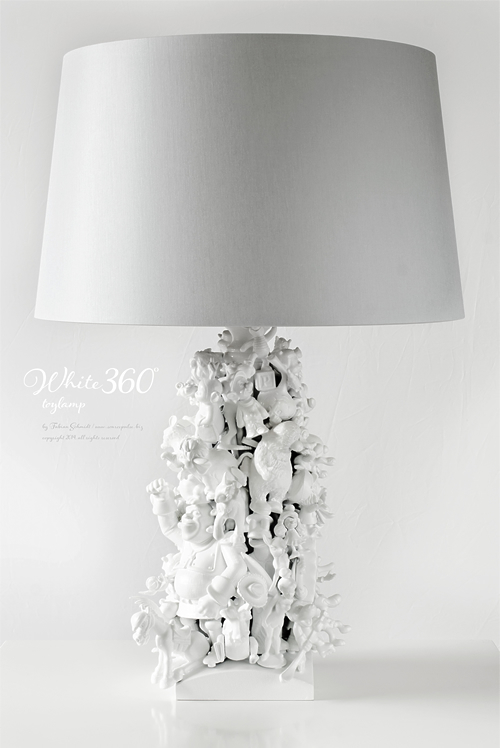 Inside the individually manufactured lampshade of classic grey chintz (Ø bottom: 35 cm, Ø top: 30 cm, height: 21 cm) was masked with a golden foil and an aesthetic danlamp® light bulb (controlled by a switch) unfolds the entire luminosity of the lamp. For sale? Contact me for a non-binding inquiry. Toy Lamp by Holger Dietz. 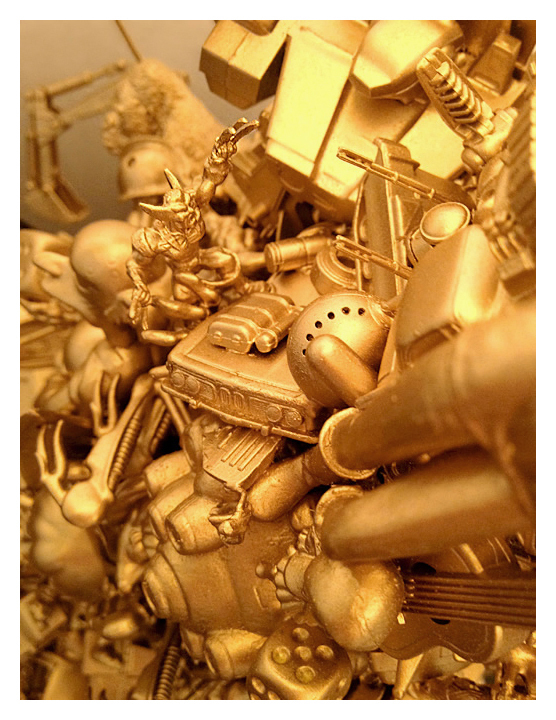 This unique lamp was built with round about 130 parts including toys from my childhood like Star Wars, Spider-Man, X-Men, Matrix, Watchmen, different robots, Manga characters, Micromachines, miniature railroad characters and many more. 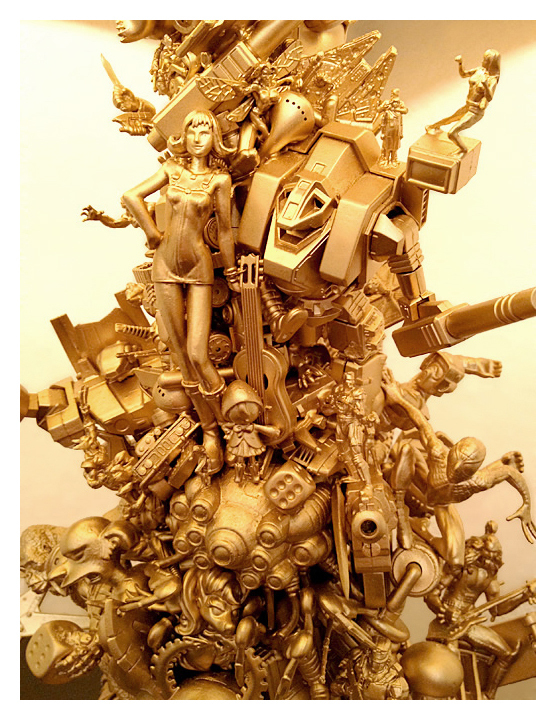 All characters were primed with gold, then glued, screwed and/or wired and finally airbrushed with two layers of Email color. And last but not least, this beautiful dust catcher also has a dimmer for the perfect ambience. 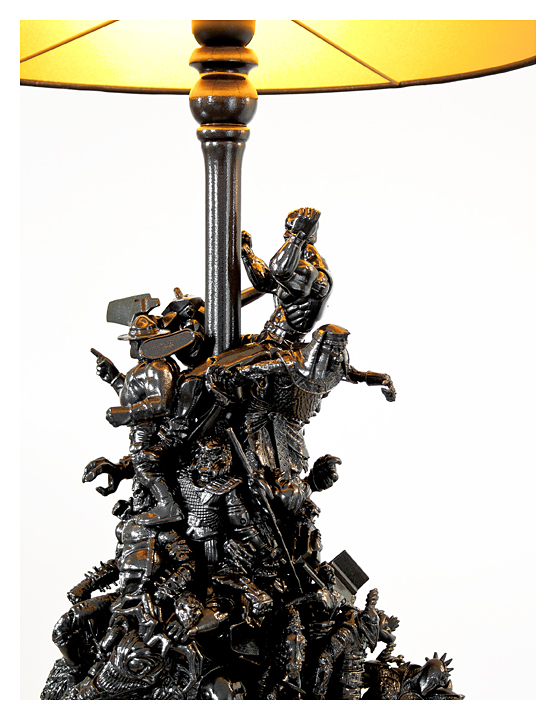 Almost all comic and fantasy characters (~ 60) processed in this handcrafted Toy Lamp derive from sinister / dark seeming comics or movies. 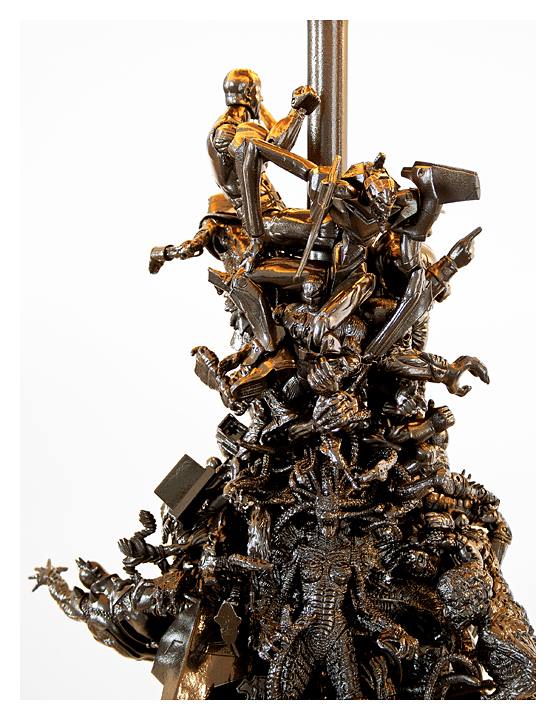 From Giger’s Alien & George Lucas’ Darth Vader to Grendel (Beowulf) and the Ghost Rider to creatures from Spawn and “bad guys” of the wrestling scene. 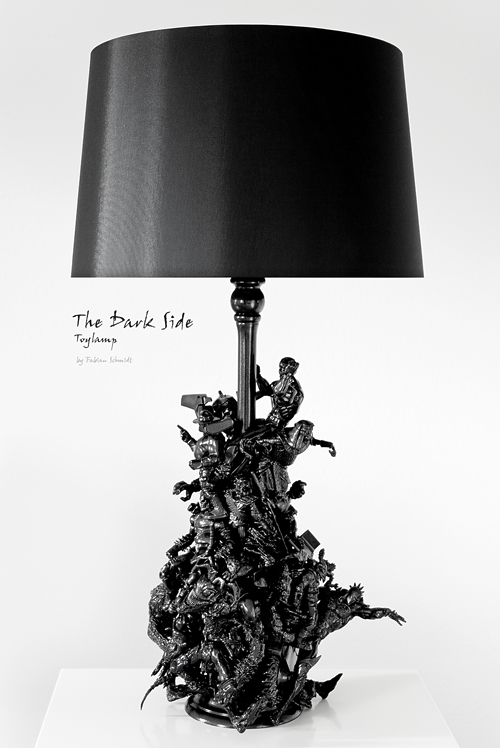 All characters were varnished in dark anthracite, draped 360° all around the isochromatic, wooden table lamp (varnished) and joined up by various methods. Finally the lamp was coated with a high gloss polyurethane finish. 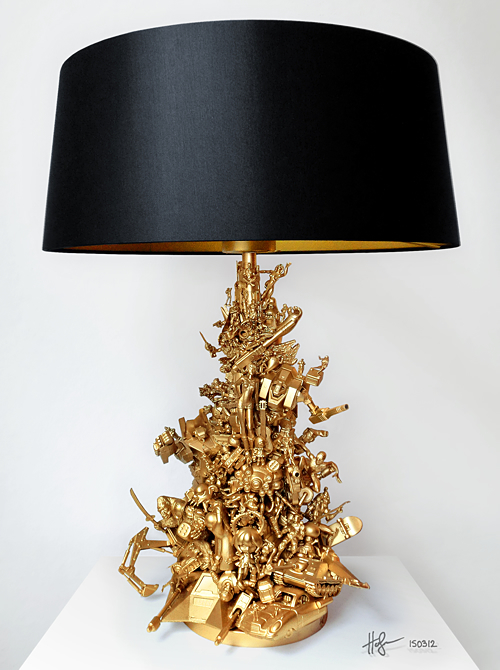 Inside the individually manufactured lampshade of classic black chintz (Ø bottom: 40 cm, Ø top: 30 cm, height: 25 cm) was masked with a golden foil and an aesthetic danlamp® light bulb (controlled by a switch) unfolds the entire luminosity of the lamp. Copyright © 2016 by Holger Dietz & Fabian Schmidt, all rights reserved. Check imprint for copyright guidelines.